Educational Technology Guy: Apple iPad - is it a game changer? Apple iPad - is it a game changer? 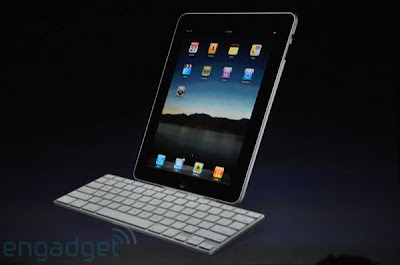 Apple just announced their long awaited and anticipated tablet/slate, the iPad. Steve Jobs described it as something between a smart phone and a laptop. It is really an over sized iPhone. It runs the same operating system and can use the same applications. iPhone apps look a little weird on it, but they are releasing a software developers kit so that developers can modify their applications for the iPad. This device has been heralded as a "game changer" by many in the technology, and education sectors. It is a very cool device, but I don't know that it is the game changer they expected. Like the iPhone, the iPad is a thin tablet. It even has the center button like an iPhone. It is 1/2" thick, weighs 1.5 pounds and has a 9.7" (diag) screen. The screen is multi-touch and capacitive. Memory comes in 16GB, 32GB or 64GB (flash memory). It has Bluetooth and WiFi also. Apple states that the battery lasts 10 hours with a month of standby. My guess this is a combination of a new chip from Apple and the fact that the operating system does not multi-task. There will be support for 3G wireless in some models too. They have a special deal with AT&T with lower prices and prepaid (no contracts). The GSM will be unlocked also. I was surprised that there is no camera on it. I would think a forward facing camera would be good for video conferencing. That's right, no mention of multi-tasking on the iPad. For me, this is not good. It also has a virtual keyboard only. These two things make this less of a productive or educational tool. I can't imagine a student doing research and creating content and projects on a device that doesn't multi-task. Every time they left an app, it would close. It would also be difficult to do much typing on a virtual keyboard that is flush with the screen instead of tilted. I think that a laptop is still a much better educational tool than this. Now, if they have an app that can use a special stylus and allow students to take handwritten notes in a digital pad, that might be useful for some. There is a Bluetooth keyboard with a stand to support the iPad at a nice angle, which would make it better for productivity and educational uses. No word on price or availability. I think the device is very cool and is great for web browsing, checking email, watching videos, playing games and the like, but I don't see it as anything that great as a productivity or educational tool. Not yet at least. I think that developers can create some great apps to make it more useful, but it has limitations. They also announced a new app for it: iBooks. iBooks is the eReader/Bookstore for the iPad. Apple has partnered with publishers to create content for the iPad. So far it just looks like an eReader. I was hoping to hear that the publishers were creating interactive books with links, popup definitions, and more. Hopefully that will come in the future. It is great for sitting on your couch and doing things but I don't see it as a great way to create things. Virtual keyboard + no multi-tasking + keyboard at same angle as screen = hard to create things. They do offer a version of iWorks for it (separate cost) so that you can do word processing, spreadsheets, and presentations. We'll see what happens as it matures and develops and more apps appear. The Bluetooth keyboard and stand is a nice accessory to make it easier to create, but then you lose the "slate-ness". You can't use it on your lap like I use my laptop or netbook. You can type with the virtual keyboard on your lap, but that takes some time to get used to. I really want to see multi-tasking and native flash support. Flash support is available on Palm's webOS. Palm's Pre and Pixi will be the first smart phones to get native Flash next month. Then Adobe will be porting the technology to other platforms. Apple doesn't seem to care about Flash but educators should. Many educational web sites, news sites, and science sites use Flash for videos, demos, and interactive activities and labs. Without Flash support, you can't use the iPad to access these things. It is a really nice device. I think that it does fit between a laptop and a smartphone as Steve Jobs said. However, I think laptops will be more useful for work and education. The iPad might be great for at home and travel, but it is lacking some things that I feel are essential for productivity and creation. 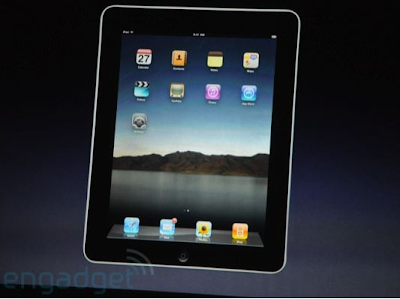 The iPad will start at $499 (16GB model) . The 16GB model with 3G will be $629. The 64GB version is $699 and with 3G is $829. The Wifi versions will be available in 60 days and the 3G versions will ship in 90 days. But my $300 netbook does more than this and has multi-tasking, Flash support, a real keyboard, support for peripherals, and millions of apps. I guess if you are already an Apple user (especially iPhone or iPod Touch) then this would be good for you. As a Windows user, I'm not as inclined to run out and buy it. I also think that a school system that uses Windows computers would be much better off with laptops, netbooks, or tablet PCs. So, that's my take on the Apple iPad. Not really the game changer I'd been hoping for, but a nice device none-the-less. Let's hear your opinions and thoughts. 1. I thought of the stylus and digital ink for math and science and engineering. You can't enter equations during class while taking notes with a keyboard. A stylus and digital ink would be great for this. A stylus, as a commenter mentioned, would also be good for art. 2. Good for current iPhone owners because they can port their already purchased apps to it. 3. Not good for education because it is expensive and apps cost money. I haven't paid for software for my classes in years because there are so many free apps available for education. 4. There is no multi-tasking now - as I said, the future may make this a better device. Freezing an app is not the same as multi-tasking. 5. Textbooks on it - like most of Apple's things, its a closed system. That means that if you start in with them, you are kind of stuck with them. I can access tons of online, FREE textbooks right now for all of my classes. My students don't lug any books around. And, instead of being stuck with the textbook the school system buys, they have multiple options. My physics students have access to 6 free digital texts and 12 online, interactive, web sites that are all better than any of the $130 physics texts I previewed. They can access these anywhere, not just on one device. 6. Netbooks - my netbook multi-tasks like a champ. I have 9 tabs open in Chrome, am running OpenOffice presentation and writer, and have a photo editor running. And, it is running very fast without any problems. Multi-tasking, USB ports, 5 x the disk capacity, and thousands of FREE applications for it. 7. I can read books on my Palm smart phone and my netbook and laptop too. I've been using an eReader for many, many years. It's nice that there will be more books available, but they will not be free. The books on the iPad will have to be something special to justify their cost. 8. I'm more of a believer of web based apps anyways. I don't want my students to have to worry about having an Apple product at school and a Windows or Linux product at home or vice versa. With web based apps, the hardware matters much less. 9. Apple's apps only run on Apple products. Apple is the only manufacturer. There is no other option if you use Apple OS. With Windows and Linux, there are multiple hardware vendors. Schools can get great deals on hardware. 10. I don't know too many school systems near me that could afford to outfit each student with their own iPad as Randolph Jakes states. Most 1:1 schools have class sets of devices that students only use in class. I stand by my opinion that this is a consumer device, not yet an educational one. It is hard to create on it due to the virtual keyboard. Reviews and surveys across the web, including Engadget, Fast Company, Edutopia, CNET, and more all show that the iPad was a let down and most people surveyed are not rushing out to order one. As it matures, who knows what it will be able to do. This is a great discussion. Let's keep it going. Discussions like this are what can push manufacturers and software vendors to create new products and push new products to new uses. Since the launch, Apple has sold millions of iPads. I've used a few that friends have, and while it is a fun device, I stand by my original thoughts. It is lacking for education. Still expensive compared to netbooks, no real keyboard (except as pay for accessory), no Flash support (a huge number of educational sites and sites used by teachers use Flash), not enough free apps. All contribute to the fact that it is not my choice for education. I think that netbooks using Google Chrome OS will be a better choice. Inexpensive, real keyboard, Flash support, tons of free apps, everything stored and sync'd in the cloud, and easy to use. I know that Apple fans love their devices, but Apple is expensive and a closed system. I like inexpensive or free, open systems better.